CST 101 is a collaborative 7-part video and discussion guide series presented by the United States Conference of Catholic Bishops and Catholic Relief Services on Catholic social teaching. The videos bring the themes of Catholic social teaching to life and inspire us to put our faith into action. Some suggested uses of the videos and discussion guides include adult faith formation settings, high school theology classes, in lay ministry formation and to prepare groups for service trips. 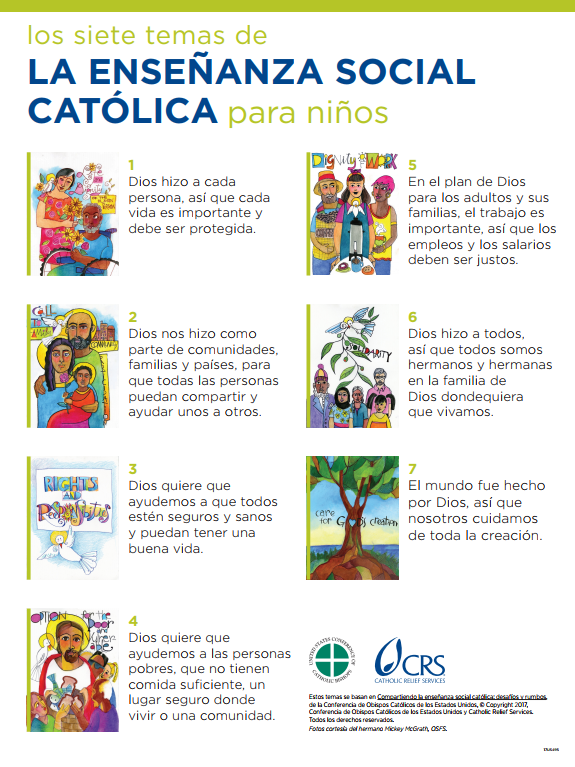 The series also includes downloadable posters and handouts for adults and kids, in English and Spanish. The artwork featured in the videos and accompanying vidoes are courtesy of Br. Mickey McGrath, OSFS. Looking for this video in Spanish? Click here. A discussion guide to help a small group learn about and reflect on the Catholic social teaching principle Life and Dignity of the Human Person. This guide was developed in collaboration with the United States Conference of Catholic Bishops (USCCB) as a part of the CST 101 series. Lesson plans for grades 1-8 about the Catholic social teaching principle of Life and Dignity of the Human Person. The lesson plans help explain the principle through the story about a young woman with disabilities in Vietnam. A discussion guide to help a small group learn about and reflect on the Catholic social teaching principle Solidarity. This guide was developed in collaboration with the United States Conference of Catholic Bishops (USCCB) as a part of the CST 101 series. 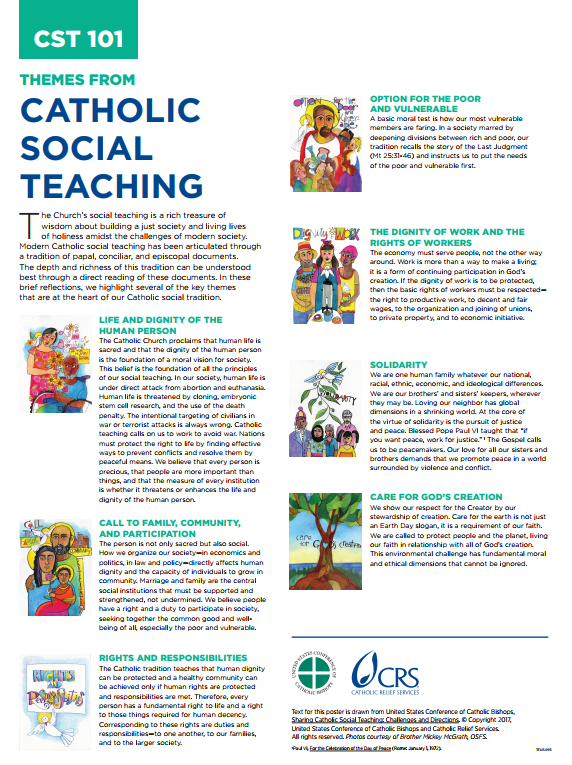 Lesson plans for grades 1-8 about the Catholic social teaching principle of Solidarity. The lesson plans help explain the principle through the story about banana farmers in the Democratic Republic of Congo who helped each other save their crops. A discussion guide to help a small group learn about and reflect on the Catholic social teaching principle Care for God's Creation. This guide was developed in collaboration with the United States Conference of Catholic Bishops (USCCB) as a part of the CST 101 series. 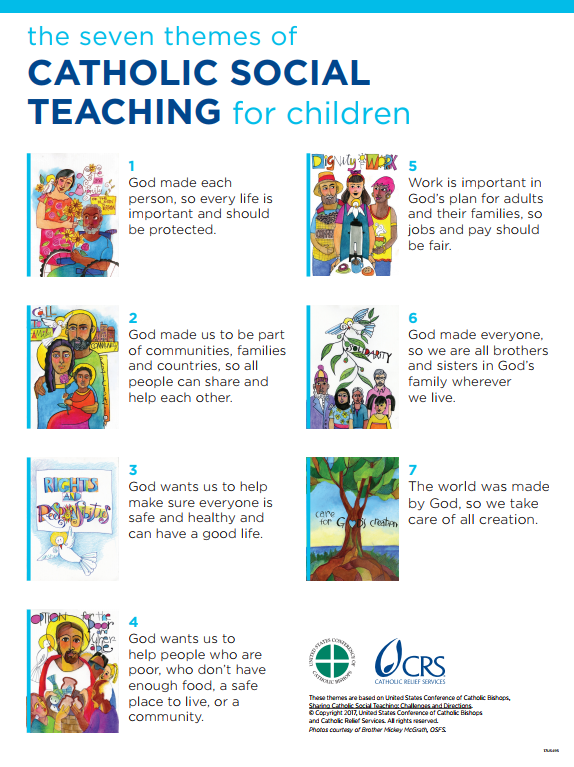 Lesson plans for grades 1-8 about the Catholic social teaching principle Care for God’s Creation. The lesson plans help explain the principle through the story of a coffee farmer in Nicaragua. A discussion guide to help a small group learn about and reflect on the Catholic social teaching principle Call to Family, Community, and Participation. This guide was developed in collaboration with the United States Conference of Catholic Bishops (USCCB) as a part of the CST 101 series. 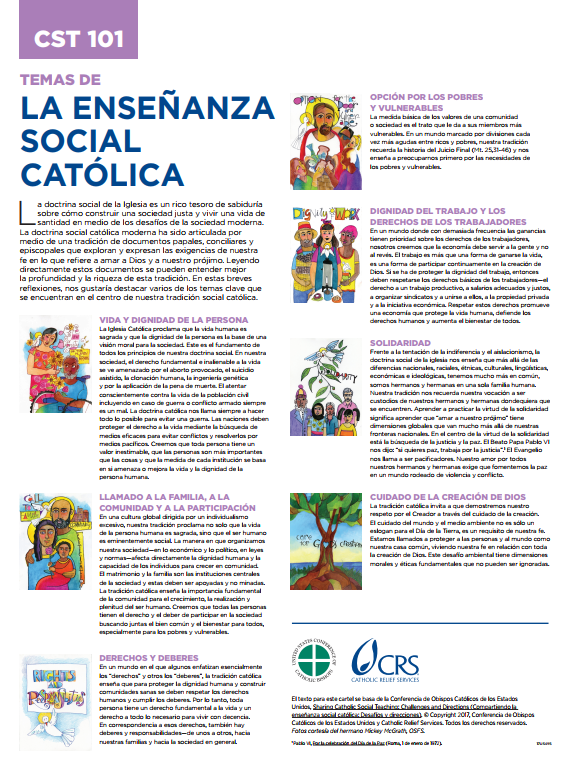 Lesson plans for grades 1-8 about the Catholic social teaching principle Call to Family, Community and Participation. The lesson plans help explain the principle through the story about groups of volunteers in Haiti that helped their community. A discussion guide to help a small group learn about and reflect on the Catholic social teaching principle Option for the Poor and Vulnerable. This guide was developed in collaboration with the United States Conference of Catholic Bishops (USCCB) as a part of the CST 101 series. Lesson plans for grades 1-8 about the Catholic social teaching principle of the Option for the Poor and Vulnerable. The lesson plans help explain the principle through the story about a poor family in the Philippines who was cared for by their community after a typhoon destroyed their home. A discussion guide to help a small group learn about and reflect on the Catholic social teaching principle Rights and Responsibilities. This guide was developed in collaboration with the United States Conference of Catholic Bishops (USCCB) as a part of the CST 101 series. Lesson plans for grades 1-8 about the Catholic social teaching principle Rights and Responsibilities. The lesson plans help explain the principle through the story about a school in El Salvador that gained access to the basic human right of water. A discussion guide to help a small group learn about and reflect on the Catholic social teaching principle Dignity of Work and Rights of Workers. This guide was developed in collaboration with the United States Conference of Catholic Bishops (USCCB) as a part of the CST 101 series. Lesson plans for grades 1-8 about the Catholic social teaching principle the Dignity of Work and the Rights of Workers. The lesson plans help explain the principle through the story of a microfinance group in Zambia.